I estimate that around 4,000 Irish people stopped in Stafford during the nineteenth century. Some only stayed a short time in the town before moving elsewhere. Others lived there for a few years but then they also left. All the time, however, a residue of people and families from this mass of migrants stayed on in Stafford, and they are the families who appear in this blog. I have identified 206 ‘families’ who stayed in Stafford for at least ten years – in other words, they appeared in at least two Censuses or there is other evidence that they were here for that length of time. These ‘families’ ranged from lone individuals through nuclear units with partners and children to complex families with a large number of related individuals and sub-groups. The pdf table below lists these 206 families and gives basic information about them. Do you think you might be descended from one of these families? Many descendants have already been in contact with me but I’m always keen to hear from new people who might have information and thoughts to offer about their Irish ancestors. In return I can offer you more information about these families’ genealogies and their experiences in Victorian Stafford. Where two surnames are shown one of the names will be the maiden name of an Irish woman in an ethnically mixed marriage or partnership. The date shown is of the first evidence we have of the family’s arrival in Stafford. Connacht: the biggest proportion of Stafford’s Irish came from Connacht, Ireland’s poorest province in the west of the country. Many originated in an area of Counties Roscommon, Galway and Mayo that surrounds the small town of Castlerea. Ulster: the nine counties in the north of Ireland that include the main industrial city, Belfast. Stafford received a small number of Ulster immigrants, both Protestant and Catholic. Munster: the province in the south west of Ireland where the main cities were Cork and Limerick. The least important source of Stafford’s Irish. Irish family: a family that was formed in Ireland and moved to Stafford as an existing unit with children who were born in Ireland. Later children may have been born in Stafford. Irish adults: a family that was formed in Stafford from Irish people who met in the town after their arrival. All their children were born in Stafford. Mixed-M: a mixed ethnicity family where an Irish-born man was partnered with a British-born woman. Mixed-F: a mixed ethnicity family where an Irish-born woman was partnered with a British born man. British: there were a small number of families where British people had lived in Ireland and had children there. These children therefore appear in the records as Irish-born and some may, indeed, have had some identity with their Irish childhood. In most cases it is possible to identify whether families were Catholic or Protestant. The majority of Irish immigrants were Catholic, as you would expect, but there was a significant Protestant minority too. Long-term transient: these families stayed in Stafford for at least ten years but ultimately the immigrants and/or their children or grandchildren left the town and the family disappeared. Many emigrated from Britain as part of the wave of emigrants to the New World in the later 19th century. Terminal: these individuals and families settled in Stafford but failed to intermarry either with Irish or local people. They literally just died out. Integrating: these families intermarried with local people and put down deep roots in Stafford. They survived into the 20th century and in many cases their descendants are still in the town today. It’s important to stress that, at the margins, some families showed evidence of more than one ‘fate’ and were difficult to categorise. Family life is complex! Hi John, do you know any more about the Dolans? especially Darby Dolan? I have recently discovered my G great grandma was an Irish immigrate living in Stafford in the 1980 .Elizabeth Lyons. Do ypu know anything of the name. I came across your website yesterday evening and have thoroughly enjoyed reading its contents. I have found your observations/comments so helpful. My paternal line ‘Kenny’ originated from Ballaghaderreen which used to be in Mayo but, after a change of boundaries, is now in Roscommon. My great great grandfather had two brothers, according to the Griffiths Valuation, both of whom disappeared in the mid to late 1880’s. I finally found one in Bradford and later found evidence of the other brother, Andrew Kenny, linking to Burslem. It seems that in 1916 Andrew’s son, Thomas, is wanting to claim his pension. An Agent from St Joseph’s, Hall Street, Burslem writes off for information about the Kenny’s in the Irish 1851 Census. Irish Genealogy confirms their presence in the Census. Andrew Kenny, born circa 1810, married a Mary Casey and Thomas is one of their children. Would you have any ideas how I might fast forward through subsequent generations? With me not having any Christian names, other than Thomas, I am unable to prove links with other Kenny’s in the area. I have just seen this website and looked on the list of Irish Families and found the surname I am researching which is “Fergus”. My Father was John Fergus born in Cloontumper, Bekan, Mayo. His Great Grandfather was William Fergus and he is shown in the Griffiths Valuation (1856-1857) as living in Cloontumper, Annagh, Mayo. William’s brother John Fergus is shown in the Griffiths Valuation as living in Eden (Eden Park), Knock. William Fergus married Bridget McGrath (McGrah) and they had four children: Margaret (b.approx 1848 – Ireland – not sure where), Bridget (b.1851), Martin (b.1854) and Mary (b.1857) – the latter three were born in Bekan, Mayo. I know that William and Bridget’s son Martin emigrated to Hoboken, NJ in 1880, married Mary Quinn who unfortunately died shortly after the birth of their second son. Martin brought his two sons back to live on the family farm in Cloontumper and is shown on the 1901 census but not on the 1911 census. I did eventually find out that he died in Manchester approx.1929. His sisters Margaret and Mary stayed on the family farm until their deaths (between 1925-1930). Martin’s other sister married a Michael Flannery from Rhanagard, Claremorris and had several children, their daughter Bridget married a James Rabbit from Woodstock, Carrowconnor, Claremorris and they were the Grandparents of Pat Rabbitte the Former Teachta Dála. I am not sure whether William and Bridget after their marriage came over to Staffordshire and if you are able to shed any light on this it would be greatly appreciated. Dear Rosaleen, many thanks for your information. The Fergus family in Stafford arrived during the Famine, probably in 1849. They were Dennis Fergus and his wife Bridget Egan and James Fergus and his wife Mary Egan. There was also a lone immigrant, John Fergus and a Mary Fergus married a Patrick Evans in Stafford in 1853. I suspected they came from Co. Mayo but had no definite information. However, I think it is quite likely that the Stafford Fergus families were related to your ancestors from the districts in Co. Mayo that you know about, and that is very helpful to me. Fergus is not a common Irish surname, so the chances they were all related are quite high. The Fergus families in Stafford proved to be ‘long-term transients’ and left the town in the 1850s and 1860s. I have not traced where they went to but it is quite likely they emigrated, perhaps to America as you have found with some of your line. So I don’t think your ancestors came to Stafford town itself. A Peter Fergus lived in Newcastle-under-Lyme in 1881 and there was another Fergus in Stockport. Hi, I am researching the Mayo family from Tipton, Staffs, for a friend. The family legend has it that there is an Irish connection. Have you come across this name amongst the Irish families in Staffordshire. I note that it is not on your list, but thought you may have some information? Hello Carol. The name Mayo isn’t on my list because I’ve no record of any Irish person with that name living in Stafford during the 19th century. That’s not to say someone with that name might not have passed through and left no record. My list only covers the town of Stafford, however, not the whole county of Staffordshire. As you already know, the surname is particularly found in the Black Country but I suspect the Irish connection, if any, is rather lost in the mists of history since many people with that surname were born in Staffordshire as early as the late eighteenth century, maybe earlier. I suspect the family legend may be false, although it’s of course quite possible one of the Black Country Mayos married an Irish immigrant at some time. I think you’ll need to take your researches back into the 18th century to find the origin of the family and its name. Dear Jeremy, how good to hear from you. I met with members of your family back in the early 2000s and received a lot of help from them as you can see in the book and blog. Let me know if there’s any more help I could try to give you about the Corcoran and Westhead families. A quick check of my family tree makes you a 4th cousin once-removed. My g.g.g. grandmother Bridget Follows (nee Corcoran) was Batholomew’s sister. We are both descended from their parents, Patrick and Catherine Corcoran. Many thanks for your support, Kayla! Dear Marie, many thanks for contacting me. I’d really welcome any further information you could give me about your branch of the Raftery family. I came across your book by chance online and realise that my great great grandmother was Mary Corcoran (Clewlow) that went to live with her daughter Ruth in Bromyard. Fascinating to read about a family that I knew very little about apart from them being of Irish origin and living in Staffordshire. My nan also named Ruth Mary -now I know where her names are from Thank you so much. Many thanks for responding to the site and the book. As you will realise, we are related through James Charles Clewlow! He was my great great grandfather – but I am descended from his first wife, Mary Hodge. My great great grandmother was brought up by her step mother, Mary Corcoran, but I also know little beyond the bare facts about the Clewlow side of the family. Do you? The Corcorans were an interesting Irish family in Stafford. I am researching a friends history – Higgins from Nottingham and it appears that John Higgins was from Roscommon (as well as his wife and her various family – Barlow, Raferty). They settled in Staffordshire, in Burslem before moving on. This is the first foray into Irish history as I have been doing my own English history for 25 years so I am not as knowledgeable about Ireland. I have a couple of basic questions I wonder if you could help me with. 1. Why did they come to the UK and why Staffordshire? Are there any records of emigration? Finding it all fascinating if not a little confusing. Thanks for this site its amazing. Why they came to Staffordshire. Many answers here. The Roscommon connection was very important in that Roscommon and the adjacent areas of Mayo and Galway were economically stressed areas before the Famine with massive land hunger, poverty and ‘overpopulation’. That meant that many men, especially, emigrated every year to do seasonal work on farms in England, and Staffordshire was a very convenient place to go because with was relatively close to Liverpool as the main port of entry to England. So many thousands of Irish from that area had connections with Staffordshire before the Famine and, for many, it was a bolt-hole to go when the Famine struck. They didn’t, of course, just work on the farms and increasing numbers went to places like Burslem in the Potteries to do labouring work in industry and on building sites etc. So that broadly explains your ancestor’s movements. Records of emigration? No, not really. No record was kept of people getting on cross-channel boats to Britain. We only know the broad numbers who arrived in Britain from Census counts of where people had been born, in this case Ireland. There are records – after the Famine – of people arriving at important immigration ports overseas like New York, but for Britain it is almost impossible to trace individual moves from Ireland to this country. 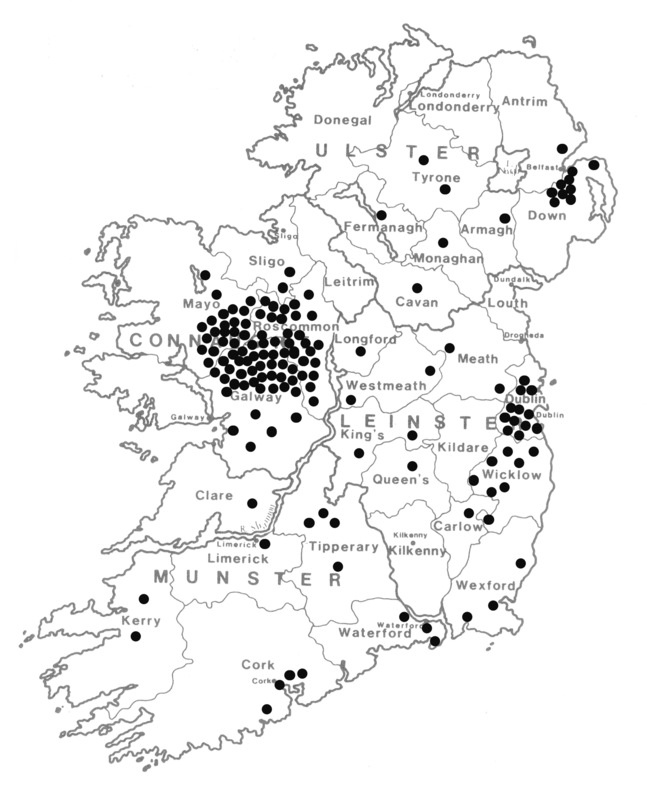 Sometimes the British Census enumerators recorded the actual place in Ireland where people had been born and it may sometimes then be possible to trace them back to families living in that area from Irish records like the so-called Griffiths valuation, the Tithe Applotments and church registers of baptisms, marriages and burials . In general, though, it’s very hard to trace ordinary people definitively back to a specific place of origin in Ireland. I don’t think I can offer much help, Ted. I suspect the original 1861 Census return is defective and that the word looking like ‘Scholan’ is actually ‘Scholar’ and that either John Riley filled out the original schedule incorrectly and was saying he and his wife and children had been ‘scholars’ in Ireland, or that the enumerator put the word in through carelessness, day-dreaming or whatever. I see that by 1871 John had died. Anna said she had been born in Kilkenny (county or city unknown) and that’s a useful clue. John Riley may have come from that area too and they might have been married there. So I should follow the path to Kilkenny – but it won’t be easy and your brick wall may still remain, I’m sorry to say. It can be very difficult – or impossible – to definitively trace people back to their origins in Ireland. You’re not helped by the different spellings the name Riley could have, either.